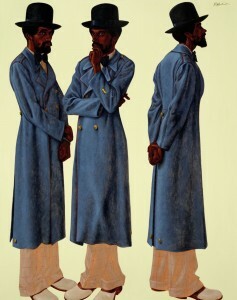 Barkley L. Hendricks, Bahsir (Robert Gowens). Oil and acrylic on canvas, 83 ½ x 66. Collection of the Nasher Museum of Art at Duke University. Beverly McIver, Love Mom. Oil on canvas, 36 x 36 inches. Collection of the Nasher Museum of Art at Duke University. 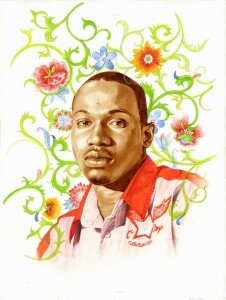 Kehinde Wiley, Ivelaw III (study). Pencil and oil on paper, 27 1/2 x 21 1/2 inches. Nasher Museum of Art at Duke University. Mickalene Thomas, Lovely Six Foota. Chromogenic print, 56 5/16 x 67 3/8 inches. Collection of the Nasher Museum of Art at Duke University. 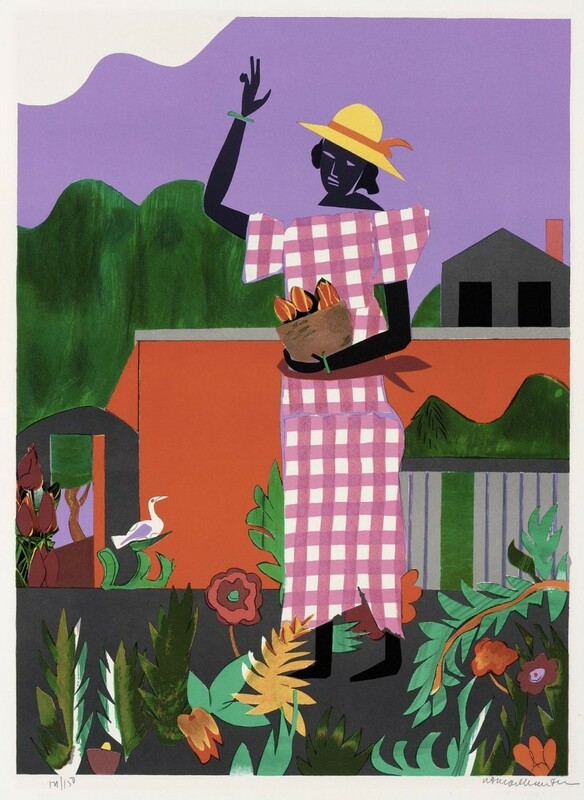 Romare Bearden, In the Garden from American Portfolio. Lithograph on paper, 28 3/4 x 21 1/4 inches. Collection of the Nasher Museum of Art at Duke University. How do artists shape our world? How do artists inspire each other? I can write a story based on a work of art. Start timer and allow students to choose their images. “I’m choosing ____, and now I have to decide whether I want this small moment here to be the beginning of my story, the middle of my story, or the end. To make my plan, I’m going to make a little representation of this picture in my graphic organizer, and then I’m going to fill in the other parts of the story. Who can help me?” (take ideas from students and label character names, setting, events, cause/effect, etc). Ask a student to review/ remind instructions (plan with NEW portrait in beginning, middle, end; draw other parts; label characters, events, setting, etc.). Have students work independently on plan; circulate to monitor work progress and to pull small groups for conferences. “Here’s the plan we made together yesterday. Who can use what they see — words and pictures — to remind us of what we need to put in our drafts?” Use VTS technique to review plan. Model draft. Refer to plan to write at least six (imperfect) sentences expressing thoughts contained in the plan. Talk through your thought process as you model. Have a student review instructions: we are finishing our plans and starting on our drafts. Dismiss students to tables to work on drafts. Circulate to tables to make notes on students process and choose small groups for conferencing. Gather students. Ask for a volunteer to review what the class is doing (using familiar portraits to inspire us to write stories). “When you work on your revisions, I want you to pick at least one noun from the beginning, middle, and end sections and add an adjective. After that, I want you to check to see which senses are missing. Then look to see if there are any more moments that you can add to make your story more exciting. Finally, you can add an introduction and a conclusion. Have a student review instructions: Revise via sense details, more events, and intro/conclusion. Circulate to identify students who need more guidance and to monitor partner revisions. Solicit 2-3 students to share their progress by reading aloud. Give support because some will probably have a hard time reading because of mistakes that need to be edited; great segue! Have students return to their desks to edit. Circulate to make sure they’re on task and to offer support and/or conferencing. Solicit some students to share their progress. Have students work independently to publish. Circulate to offer support/conferencing. When students feel convinced they are finished, they may meet to conference/share with each other. End of class: Read aloud or let students read aloud their own stories. Beyond Grade Level: Put two or more images together to make the plan. Below Grade Level: Labeled plan; one sentence each for beginning, middle, end. Student followed and kept track of her/his progress through the 5 steps of the writing process. Student followed and kept track of her/his progress through 4 steps of the writing process. Student followed and kept track of her/his progress through 3 total steps of the writing process. Student followed and kept track of her/his progress through 2 or fewer steps of the writing process. Student has written 6 or more complete sentences in response to the prompt, using language that connects their feelings to artistic techniques and providing examples as evidence to support her/his opinions. Student has written 6 distinct thoughts in response to the prompt. Student’s work is 2 or fewer complete sentences or does not stay focuses on the prompt. Student did not follow prompt or did not produce. CUPS followed all the time. CUPS followed most of the time. Some CUPS mechanics displayed. Almost no complete sentences, capitalization, spacing, correct letter formation, or punctuation. Student followed agreed-upon rules, listening and building upon partners’ thoughts all the time. Student followed agreed-upon rules, listening and building upon partners’ thoughts most of the time. Student followed agreed-upon rules, listening and building upon partners’ thoughts some of the time. Student followed agreed-upon rules, listening and building upon partners’ thoughts rarely or not at all. 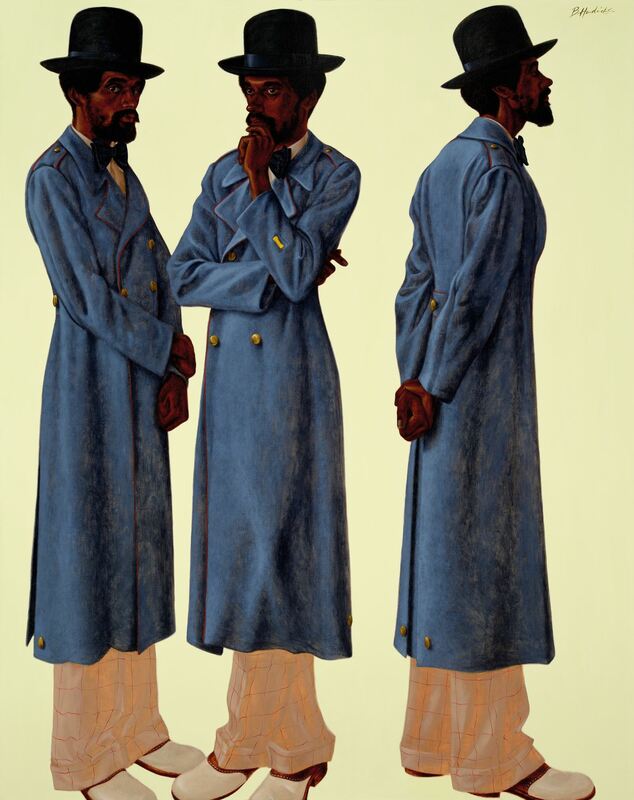 Barkley L. Hendricks, Bahsir (Robert Gowens), 1975. Oil and acrylic on canvas, 83 ½ x 66 inches (212.1 x 167.6 cm). Collection of the Nasher Museum of Art at Duke University, Durham, NC, USA. Museum purchase with additional funds provided by Jack Neely, 2007.5.1. © Barkley L. Hendricks. Photo by Peter Paul Geoffrion. 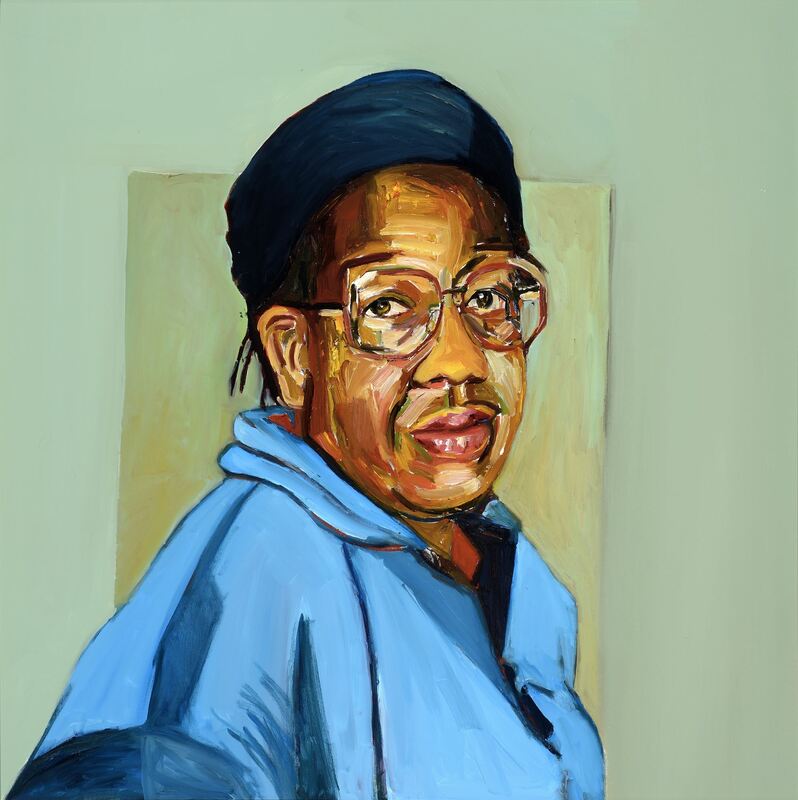 Beverly McIver, Love Mom, 2011. Oil on canvas, 36 x 36 inches (91.4 x 91.4 cm). Collection of the Nasher Museum of Art at Duke University, Durham, NC, USA. Museum purchase with funds provided by Marilyn M. Arthur, 2011.1.1. © Beverly McIver. Photo by Peter Paul Geoffrion. Kehinde Wiley, Ivelaw III (study), 2006. Pencil and oil on paper, 27 1/2 x 21 1/2 inches (69.9 x 54.6 cm). Nasher Museum of Art at Duke University, Durham, NC, USA. Promised gift of Blake Byrne in honor of Raymond D. Nasher, L.4.2007.36. © Kehinde Wiley Studio. Photo by Peter Paul Geoffrion. Mickalene Thomas, Lovely Six Foota, 2007. Chromogenic print, 56 5/16 x 67 3/8 inches (143 x 171.1 cm). Collection of the Nasher Museum of Art at Duke University, Durham, NC, USA. Gift of Christen and Derek Wilson, 2010.12.1. © 2013 Mickalene Thomas and Mickalene Thomas Studios, Inc.
Romare Bearden, In the Garden from American Portfolio, 1979. Lithograph on paper, 28 3/4 x 21 1/4 inches (73 x 54 cm). Collection of the Nasher Museum of Art at Duke University, Durham, NC, USA. Gift of Mr. and Mrs. Daniel and Carolyn Klein, 1980.81.5. Art © Romare Bearden Foundation/Licensed by VAGA, New York, NY. Photo by Peter Paul Geoffrion.